I drive up to the back entrance at Yards on a cold and windy day. If not for the newly developed condominiums and casino down the street, this could easily be mistaken for a brewery from an earlier time in Philadelphia’s rich history. I park on a little-taken-care-of cobble stone street, facing a red brick building teeming with the smells of brewing. One can certainly imagine a day of similar setting where wooden casks would be rolling off the back of livery wagons while men 100 feet down the line were filling them back up. The sound of hammers sealing the casks with bungs is perhaps the only part missing from this simple yet storied back lot. Upon wandering through the brewery for a bit, I find Tim and we have a seat in the tasting room. I know he’s a busy man. 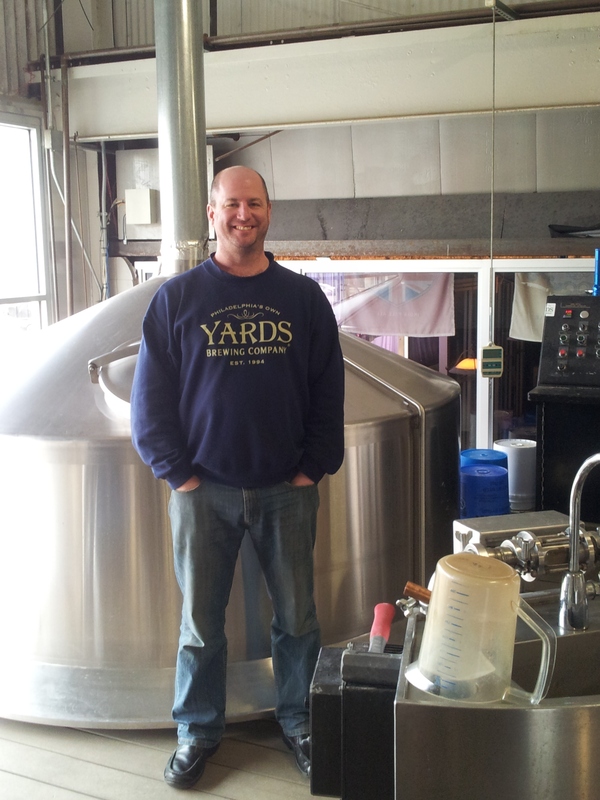 Tim is responsible for the Yards beer we all love. If there’s a problem in the brew house, Tim is who gets summoned. Towards the end of the interview I picked his brain about one of my favorite beers, Philly Pale Ale, and how homebrewers can make it at home. But below is an account of just two guys talking beer and brewing. Me: How long have you been brewing? Tim: I guess it started in ’98 at Dock Street with sort of the same people who opened Independence Brew Pub in the Reading Terminal Market. And then I started here (at Yards) almost exactly 5 years ago. Me: What kind of system do you guys have here? What’s the capacity? Tim: The brew house is a 50 barrel JV system that was originally a three vessel system that we added a kettle to. It used to go into the mash-mixer then into the lauter and then back for the boil. Right now our capacity for the whole brewery is 36,000 (barrels) and we’re able to do about 50,000 (barrels). Me: If you could somehow own a brewery that turned a profit brewing just one style of beer, not one beer, but one style of beer, what would it be? Tim: Honestly it would be a Pale Ale. What I look for in beer most of all is balance. It’s important in every beer, but especially in a Pale Ale. It’s not too bitter, not too sweet. You can taste the malt, you can taste the hops, it’s my ideal beer. It sounds kind of boring to say but it would just be a Pale Ale. Me: Have you ever lost a batch here at Yards? Tim. Yeah. We have had to dump beer. We had some beer infected at the end of August that we had to dump. Me: Most homebrewers dream of opening their own brewery. Finances and government paperwork aside, what is a good first step for someone looking to turn pro? Tim: I would say you do not want to start (turning professional) by opening a brewery. I think you would want to get actual (professional) brewing experience. I think the consideration is the two arms of our industry. There’s brew pubs and then production breweries. If I were looking to open a business, I would try to get experience working in both, or even volunteering. Tim: Partly tradition, partly our taste. Yards was founded on English ales, and not to say that we can’t do something new or experiment but we’re pretty committed and we really like ales. From here I tell Tim that I’d like to ask him a series of rapid fire questions. Short questions, short answers, just the first thing that came to mind. I really enjoyed this part, as it’s a toned down Q&A of some of my favorite things about beer to debate. Me: Imperial IPA or Double IPA? Me: Hops, pellet or leaf? Me: Yeast, American or English? Me: Malt, Pilsner or Pale? Me: In an underground street fighting match, Tom Kehoe or Carol Stoudt? 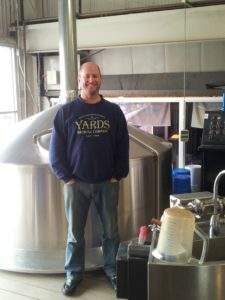 With Tim’s guidance, I put together a recipe for homebrewers who love the Yards Philly Pale Ale. This Pale Ale is tilted to the hoppy side, so the hop selection is important. Also, the yeast is the same strain that Yards uses, so except no substitute!